In my quest to find the perfect media server tower case, I had a rather simple list of requirements. It needed to have plenty of space for expansion, keep everything cool even when it is fully loaded, be whisper quiet, and look good while doing it. Read on to see if my journey is finally over. The thought that was put into the packaging of this case was quite evident. It arrived double boxed with 1.5" of padded space between the two cartons. The case itself was further buffered by another 1.5" of molded closed cell foam end caps. The body of the case was protected by a band of corrugated cardboard. Once that was removed, the aluminum panels were all covered by contact adhesive plastic to protect the finish. Obviously, this packaging job was essentially a challenge to the blokes at UPS. Fortunately, my review case arrived unscathed, but I can't help but wonder how much this added to the final cost of the product. The first order of business is to check all the metal edges for sharp corners. The cage surrounding the PSU has some stamped openings that have been filed, but are still somewhat sharp. Everything else has either a rolled or folded edge to protect against cuts. Next is the vibration test. With the case sitting on the floor, I tapped lightly on each face and corner of the case to see what rattled. 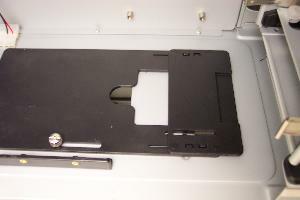 Tapping the sides of the case resulted in a very dull thud, but the top and front caused the 5.25" bay covers and the expansion slot covers to rattle loudly. 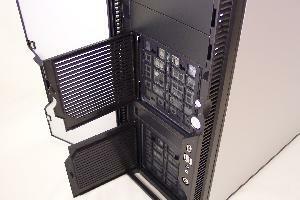 Obviously, once a motherboard is installed, the expansion slot covers will either be removed or held in place. 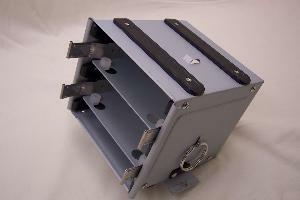 However, the 5.25" bay covers may continue to be a problem once the case is operational. Since they are black, perhaps some strategically placed electrical tape would remedy the problem. The front door is made similarly to the sides, but with thinner plastic. I've not typically been one for cases with doors, but in this situation it certainly cleans up the looks from the front. There is a column of vent slots all along both sides of the door to allow for adequate ventilation when the door is closed. 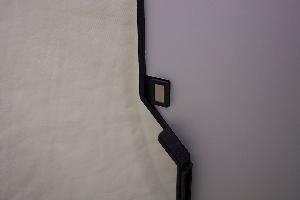 The door itself can be folded all the way back until it is touching the side panel if the user wants to have the look of a door-less case. When closed, the door is held by a couple magnets. Opening up the case revealed everything to be well secured. More times than not, when I receive a case, I find the various bits and pieces rattling around inside to get wedged where it's near impossible to retrieve. Everything was either in a box or attached to the case itself. 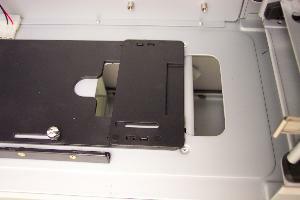 To speed up installation, the P180 uses drive rails for the 5.25" bays and drive sleds for the hard drives. One of the major selling features of this case is its ability to minimize noise. Several case have manufacturers claimed groundbreaking design techniques, but few actually deliver and some actually make things worse. Let's take a look at the various ways that Antec actually accomplished pulled this off. The most obvious difference in this case is the internal cavity is divided into two separate chambers. The thought is that if the items that generate the most heat can be segregated, then the overall system temperature and noise will be reduced. 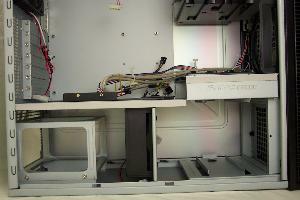 The upper chamber is designated for the motherboard, expansion cards, 5.25" and some 3.5" drives. A total of three 120mm and one 80mm fans can be used to assist in the cooling of this section. 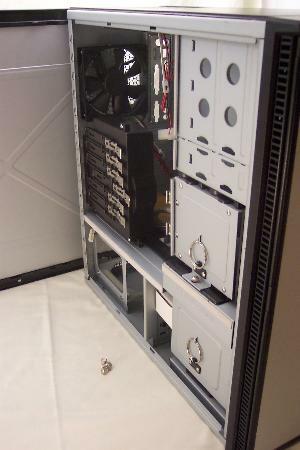 The lower chamber resembles a wind tunnel and is reserved for the PSU and more hard drives. This section is cooled by a 120mm fan mounted between the PSU and hard drives. Choosing to mount the fan internally should help remove that as a potential noise source. The two chambers are separated by a sliding panel. 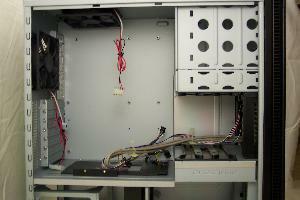 This allows the PSU cables into the upper chamber and the hard drive cables into the lower chamber. 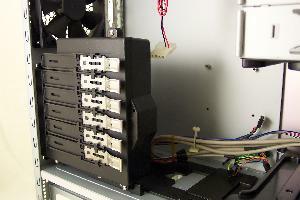 Once everything is wired up, the panels slide closed to "seal" the chambers. Obviously, hard plastic can only seal so well, but it is certainly sufficient in this application. 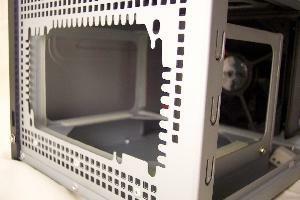 The hard drive cages each feature a ring to help in removal. This ring is held firmly in place when not in use to prevent rattling. 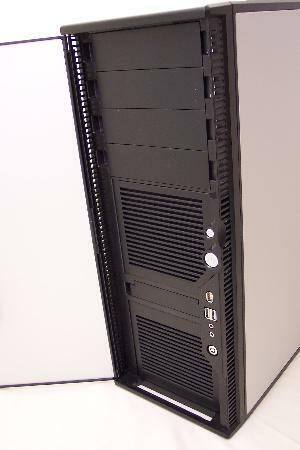 The upper cage features silicon grommets mounted to drive sleds to help isolate the hard drive vibration from the case. The two horizontally mounted drive sleds snap firmly into the drive cage. 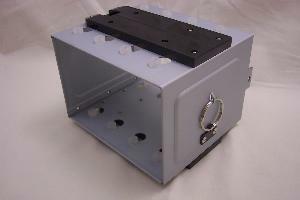 The upper drive cage also has a small plastic box located on the far side to hold the various screws and parts that are left over after the build is complete. The lower drive cage also features grommets for vibration isolation, but since the drives are mounted vertically they don't use drive sleds. This can be a bit of a pain if the user wants to swap drives from one cage to another. This was a conscious design compromise as the grommets need to be in a vertical position to function correctly. The noise deadening properties of the side panels were briefly mentioned before. They are constructed as a 1/8" thick panel of plastic sandwiched by two pieces of aluminum. 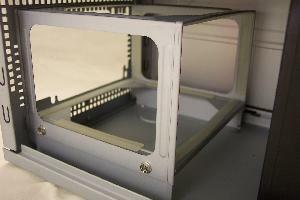 In addition, the inside aluminum panel has been pressed with a ribbed pattern to further increase its stiffness. The panels are held in place by thumbscrews and over sized plastic tabs. 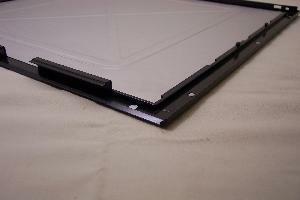 A type of foam tape has been used where the chamber division wall comes in contact with the side panels to give additional support. The end result is a very rigid and noise proof composite structure. 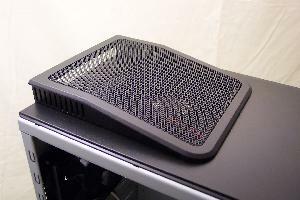 The PSU cage has similar strips of foam to help isolate fan vibrations. The cage is also constructed to allow the supply to be mounted either right side up or upside down depending on the user's requirements. 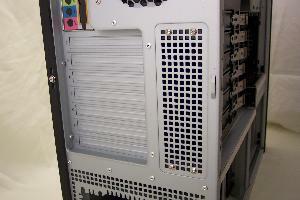 The cage is also center within the space to allow air to flow around all sides of the PSU. This should help to cool a fanless PSU if one was used. Apart from the concept of dual chambered design, there are several other features to help in keeping the PC cool. Because heat naturally rises, the top of an enclosure can me significantly warmer than the bottom. Typically, the fan in the PSU pulls this heat out the back. Not only does this require the PSU to "cool" itself with hot air, but the newer PSUs have a bottom mounted 120mm fan. This is handy for exhausting the air from the CPU, but it leaves a spot of hot stagnant air at the very top of the case. Because the P180 doesn't have a PSU in the top to help vent this hot air, it instead uses a 120mm fan located at the top rear of the case. 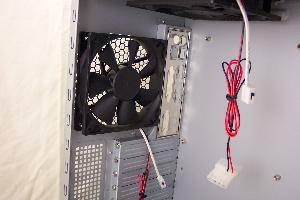 This can typically be a very problematic location due to noise, but Antec tried to remedy that by designing a shroud around the fan exit to direct air and noise toward the rear rather than the user's ears. 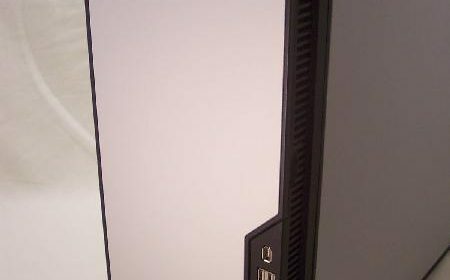 The P180 also features a 120mm fan for the upper chamber on the back of the case where the CPU heat sink is usually located. There is also another 120mm fan mounting bracket on the front of the case to aid in cooling the hard drives in the upper drive cage. Both this front fan and the opening for the lower chamber have removable filters that can be removed without opening the case. The clips which hold in the filters are a bit of a pain to operate, but they seemed to improve after a few attempts. All grills are the stamped honeycomb style for reduced noise due to wind turbulence. 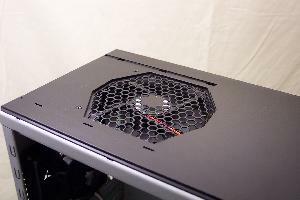 The last 80mm fan is located in a duct designed to remove hot air from the vicinity of the video card. Antec doesn't supply this fan with the case, but one can easily be found from a third party. The duct can move about 1" along the bottom of the upper chamber to maximize performance. When it is fully extended, there is a bit of a gap in the two pieces which make up the duct structure. A few wraps of tape should seal it once adjustments are finalized. 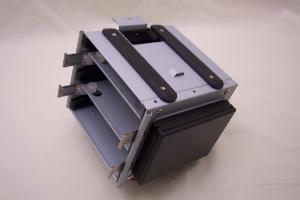 Antec has chosen to use the space offered by the side of the duct to store spare 5.25" drive rails. They are held firmly so they don't rattle while the 80mm fan is operating. All three included 120mm fans draw power from a 5.25" Molex style connector rather than the typical fan header that can be plugged into a motherboard. All three also have a select switch that allows the user to choose between three RPM values. I found the lowest to be essentially silent, and the middle to be slightly noticeable, and the highest to be overwhelming. I would recommend the lowest setting for all fans with the possible exception of the fan in the lower chamber. Because of it's location, the user may be able to get away with a higher setting without noticing the additional noise. 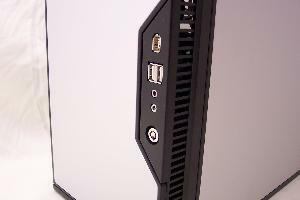 This case is without a doubt packed with features and innovation designed to make an excellent home for a media server. True, its $120 price point places it in the upper market range, but consider this; a quality case coupled with a great PSU will last several PC generations. When you amortize this cost over several PCs, it starts to become quite affordable. Going back to reflect on my four original requirements for the perfect media center tower case, I think my search may be over. With room for a full ATX PSU, full ATX motherboard, six hard drives, four 5.25" drives, and one 3.5" drive, there is plenty of room to spare. Tremendous thought went into the cooling efficiency of this case. 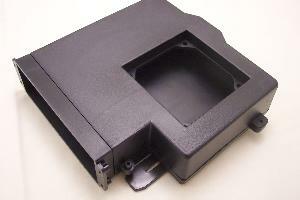 No matter what the user may have loaded, fan and ducts can be configured to cope with the heat. With cool a running system comes the concern with overly loud fans and case vibrations and rattles interfering with the user's concentration. In this area, Antec really went all out. Dual chambers, drive grommets, deadened side panels, and three speed fan all contribute to an essentially silent experience. Last up is case appearance. What can I say? With the front door closed it attains the appearance of an aluminum dipped monolith from Arthur C. Clark's 2001. While there are a few cons listed, most of those are minor and can be remedied. My conclusion is the Antec P180 is a must buy for the money.